Whenever the history of Pakistan’s democracy is drafted, name of Karachi Press Club (KPC) will be penned with golden ink. Journalists, supporting democratic forces, never permitted any dictator to enter the club’s premises till today. With all the latest facilities, this Victorian building has its own remarkable history. 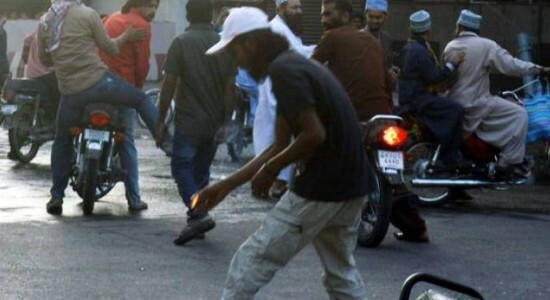 But its dignity was violated and disrespected when some alleged members of Tanzeem Anjuman Talba Islam, student wing of hard-line Sunni Ittehad Council, attacked KPC this March 27. This ugly situation arose when members of these groups were protesting against Mumtaz Qadri’s hanging for killing the governor of Punjab. Despite government restrictions, some journalists did cover the protest. During the demonstration, some armed hooligans tried to enter the KPC but were stopped by security. Subsequently, they went on a rampage and started firing, throwing bottle bombs onside the club premises. As it was a Sunday evening, the strength of journalists was quite thin; therefore, Allah saved lots of precious lives. A broadcast van of Jaag News, while busy in coverage, was attacked and damaged. The angry protestors tried to unsuccessfully burn the van. But they took away at least three cameras. Further, a reporter of Jaag News Abdur Rehman Farooqi and cameraman Sohaul Burfat was beaten up. This was first of its kind armed attack on KPC, thus most of the journalists gathered to protest against it. They demanded immediate inquiry and action against the perpetrators. Sindh information adviser, Moula Baksh Chandio, came to the club in half an hour. He ordered immediate action against people responsible for desecrating the sanctity of this prestigious building. A case has been lodged against unidentified armed men, under Terrorism Act and other sections; 7ATA, 427,511,436,379,149,148,149 at Artillery Maidan Police station, Karachi. The next day police arrested seven accused from ATI. They are Umair Khan, Ubaid Ahmed, Khwaja Raza, Zafar Iqbal, Mohammad Raza, Abdul Qadir and irfan. At an emergency meeting chaired by KPC president, Fazil Jamili, where with consent of all journalist union, a decision was taken against the Sunni Ittehad Council by banning their entrance in the club and holding press conferences. Additionally, journalists were requested to boycott the group’s coverage. The club from its birth, has followed strong democratic values by holding regular elections on time. Additionally, KPC has always played important role in raising voices of the poor and deprived people. It followed this tradition even in sensitive cases of the Baloch missing people’s families. The club had to bear pressures from different agencies not too give them their platform but it refused to be budged. The attack has brought to the fore several security weaknesses, such as low boundary wall. It needs to be raised to meet safety standards. There’s an urgent need of action to overcome these weaknesses. The author is manager of Karachi Press Club Safety Hub. Caption: Attackers putting fire outside Karachi Press Club in Karachi on March 27, 2016.